So you’ve decided that you want to sell products online. You’ve selected products, set up a website but are now at the stage where you are looking for marketing channels to promote your products. There are bucket loads of channels that you can use to market your products, whether they are affiliate products or even physical products. Here’s a list of the most popular ones that are on the web. I suggest that you select a few that you fancy trying out and add them to your marketing plan. Assign a specific measurable goal on your plan too, for example, add 5 of your products to each channel. This will give you a clear idea whether the channel is suitable for promotion of a particular product. Once you find a channel that works for you – then you’ll need to scale up your efforts to make the best of it. There are plenty of other sites and methods that you can use to sell your goods. Many of the ones listed here are free – remember start small and once you find something that works, then build it up. Which ones do you use? Everybody loves something for nothing, we all want to believe that there is still such a thing as a free lunch. For new fans to a Facebook page, there still could be. These applications all offer an incentive or encouragement to new fans. Be sure not to contradict the policies that Facebook has set out, but other than that, they are a great way to encourage new fans to like a page. They work particularly well for the younger set, and it might be that affiliate marketers find them of the most value. This applications allows branded gifts to be created. It is easy to modify the CSS file so that it will match with the image of your brand. You can attract the attention of fans by personalising the 130x130px icons. There is a traffic graph in order to track the response and reach that you attain too. 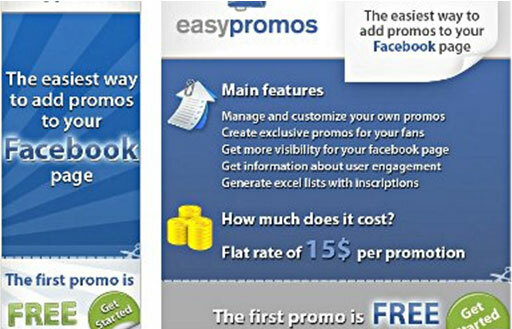 Promotion tabs are easy to create and customize with the EasyPromos application. The first promotion is even free to get you started, and after that with a flat rate of $15.00. Study the features and configurations to get the best from this, but it is generally easy to set up. You can force people to like your page before they complete a form, and that helps get the fan count increasing. Take care not to violate any of the Facebook Promotion Guidelines before you use it though. Once you’ve set up your promotions, feel free to share them here so that you can benefit the most from your work. You never know, you might attract some new fans from the readership of this blog. If you want a helping hand then we’re here to help and can even do it for you. If not, then let us know how you get on. One of the methods that professional bloggers use to gain more traffic is guest posting. Writing a post for a blog site will mean that you have the opportunity to gain more traffic and to build more links to your own site. If the readers like your post, it is possible that you will also acquire them as subscribers to your blog. So what do you need to do to get started? You need to search for blogs and influential people in your niche. There are several methods to do this. First off, you can try a Google search. Add your niche where I have put the XXXX and search on ‘XXXX blog’ or ‘XXXX guest posts’ and check whether these sites are looking for new content. You could also use the ‘Blog’ search term down the left hand side of Google search results to find blogs in your niche. If you have been online for sometime, it is likely that you know which blogs are the most influential and considered the top blogs. Browse through these sites to look for words such as ‘Write for us’ or even ‘submit your post’ as they are indicators that the site is looking for contributions in the form of blog posts. Alternatively, you could write to the owners of blogs that you enjoy reading in your niche to ask whether they would be interested in a post written by you. Deliver your best writing – the more useful and valuable your contribution is to the readers, the more likely you will be invited to write again for the site, or even for other sites. It is also quite likely that your post will be promoted around the web by your readers and this way you will gain more traffic and links. Use anchor text – by adding your keywords with a link through to your site, you will be confirming to Google that your site is related to those words and your search engine results will improve. Respond to any comments – be polite and friendly enough to return to your post to respond to any comments. Nobody likes to feel as though they are being ignored. Easy subscription – by making it easy to subscribe to your blog on your own site, you are more likely to invite and retain readership of your new followers. Guest blogging is free and it’s fun. It’s a way to interact with the blogging community in your niche and get your site and your name out there. Make the most of it by using the above techniques and you will reap the rewards from it. Social media marketing really is quite a commitment. After all, it means juggling various social media accounts, researching and writing blogs and you may be asking yourself – am I really getting anywhere? Well there are a number of metrics that you can take each month to understand how far your reach is and whether readers are engaging with you. In this post, I’m going to share with you how to measure whether your blog is performing effectively and growing in readership and the engagement of your readers. How many visitors have been to your site this month? Is the traffic increasing? How many comments are you gaining per post and is this increasing? Are you gaining links to your posts and tracking them? If you find that all your numbers are going up each month, then you could guess quite correctly that your content is not only engaging your readers, but you are gaining some great back links from others sharing and promoting your content for you. Through practice and experience, it has become increasingly clearer that to really be successful at promoting a blog, it is important to spend just as much time away from it as on it. At least half of your blog time should be spent on the blogs of others, reading and making comments. By becoming part of the blogging community in your niche, you will find that people will be helpful and will help promote your blog, and will visit it to make comments. So what else is there that you should be measuring? Keep an eye on your page rank. With an increase here you will find that your search engine ranking will improve and so will your traffic count. Try Googling your keywords and the name of your blog for starters, and then use SEO tools to track how you are performing. If you have other ways that you use to measure your success, then please let us know by leaving a comment.